Skagerrak frost is a pendant lamp in the same size as the Skagerrak frost table lamp. It is sewn in a transparent laminated mesh of white threads wich forms a grid pattern. 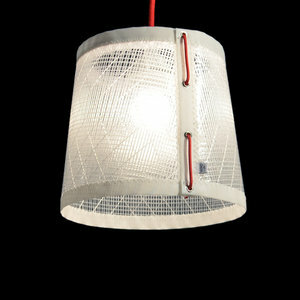 The lampshade is held together by a thin red rope threaded through eyelets. The transparent cloth gives the light a shimmering impression where the luster of the laminated wires reminiscent of sparkling sunlit frost. It has a ceiling plug, a cover cap and a cloth coated cable. The lamp fitting is standard, E27.